The blog updates have been a little patchy recently because I’ve been busy with… moving in. A few things still need finishing off internally – and the air pressure test needs repeating now that (hopefully) the main air leak has been sorted out – but mostly the internal fit-out is complete. The weather is also turning colder and I always said I wouldn’t be spending a third winter in the caravan (bear in mind the house was meant to be finished in August) so I’d rather be in a not-quite-finished house than in the caravan. It’s a but early for first impressions but one surprise is that the MVHR isn’t distributing the heat around the house as much as I’d expected. As a consequence there are Warm rooms and Cold rooms, though exactly where you’d expect – Warm on the south side (especially when the sun’s out) and Cold on the north side. The bedroom under the Plant Room is also warmer than the others, since the Plant Room houses the GSHP and the DHW cylinder and so tends to be at 21 – 22 degrees, even in winter. One quick conclusion I’ve drawn is that the underfloor heating zones do need their own controls. 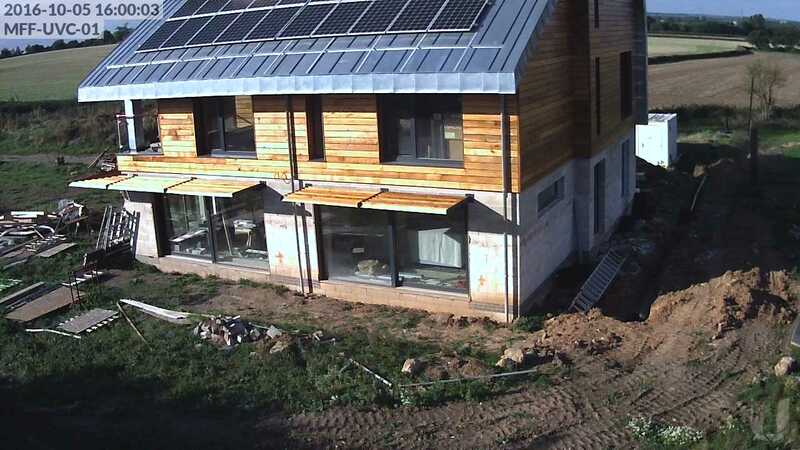 The Open Plan “Family Room” on the south side has two UFH zones and heats up quickly – and then if the sun comes out it gets significant solar gain and is in danger of over-heating, so it’s best to keep the UFH low (aiming for a slab temperature of around 22 degrees). However, controlling the UFH pump based on the slab temperature in that room means the other zones stay a bit too cool. Time to invest in some individual zone valves and a KNX-enabled controller. Work on the outside is still ongoing and won’t be complete for another month or so.